Like the Outbreak Manila Facebook page. Copy the link of this blog post (http://kikayrunner.com/2013/04/join-the-zombie-horde-at-outbreak-bgc-2). Paste it as your status on Facebook with a brief explanation of why you think you will be an awesome zombie. Tag the Outbreak Manila Facebook page in your status (@outbreak manila). Paste your explanation in the comments section below. 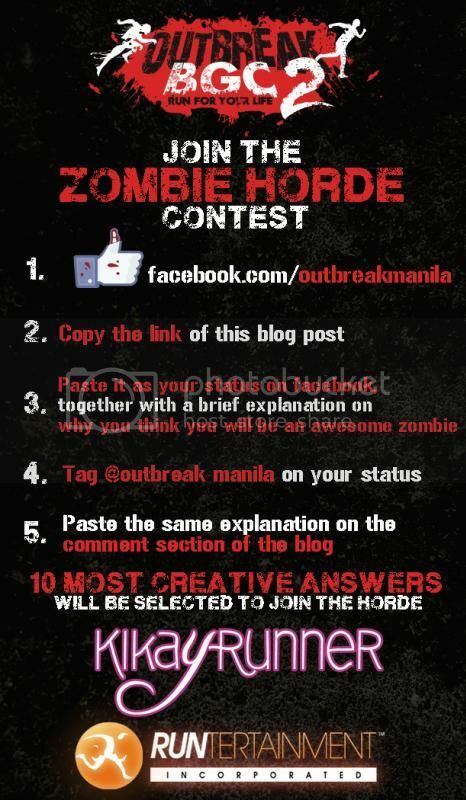 The 10 most creative answers will be selected to join the horde! It’s your time to shine– er, I mean, moan, groan, and stumble after your hapless victims. Ready? Go! UPDATE 04/10/2013: contest period is over! Please stand by as the organizers email the contest winners. Help Me Win a Quintana Roo Frameset! I think I would make an awesome zombie because I love the thrill of chasing someone. Being part of the horde will give me a chance to be a hunter instead of being part of the hunted. I will be a lightning fast cunning killer that loves the thrill of the chase and definitely shows no mercy. Problem though, where am I gonna stash the hundreds of flags that I’m going to take? All we wanna do is eat your brains. We’re not unreasonable–– I mean, no one’s gonna eat your eyes. Why am I going to be an awesome zombie? Because It’s part of my Bucket List to become one before one eats me out! and, oh! because I will eat yer Balls to bits & pieces!!! I will be an awesome zombie because you can’t out run me. Over my dead body! I’d be an awesome zombie coz you don’t need to put much effort to make me look one. And to be part of the horde will be an exciting experience for a former runner like me. With a recuperating knee injury, I’ll be in character the whole time. Braiiinnnnnnnnssss! I would not only be an awesome one, but also the most “BIBOng Zombie” reigning in the horde. Jump – Glide – Dash – Dive – Run and even Sing&Dance would be my overall package and hopefully just before the Outbreak would start, I could manage the Flying skill so that I can gather bountiful BRAINS — Literally Brains!!! Please pick me, I’m dying and thirsting enough on those juicy Brains! Would promise to share enough brains to our packs and horde after the race. – Jujitsu; A skill that I learned from my father. The monkey and snake moves would be a perfect combination to tackle and knock those whining aliens, I mean those precious mankind. Whappak!!! – pa-Pogi Looks; Naaaahhh it comes naturally. Attraction is a great way to linger and corner a unit of brain. OOouyeah! I assure that the Motocross, Cooking, Jujitsu and pa-Pogi Looks would hit the top on making and naming myself as one of the awesome zombies in the horde. and who knows a top brain earner of the night too. Caution : Batteries not included.